Or, as John and I called it, the tastiest tilapia we have yet to encounter...Seriously. I've always enjoyed tilapia, but I've never had it like this. It was rich, flavorful, decadent and absolutely fantastic. In spite of that adjective overload, I'd use more if I could. I will hands-down make this again. I really think it would be a great dish for company, and hopefully I will have the chance to do that soon! While the ingredients and preparation instructions may appear, at first, a bit lengthy, I assure you this is very doable for the average cook. 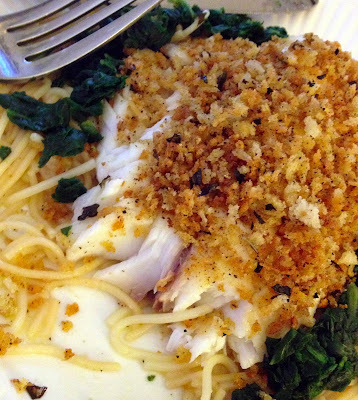 I highly suggest combining the tilapia with the pasta and sauce listed below (and pictured!). They come together easily, including preparation timing. Enjoy! Note: Steps beginning with ** refer to the pasta and sauce. Feel free to skip these if you'd prefer to make the fish alone. **Prepare pasta according to package directions. *Add breadcrumbs to a small saucepan over medium heat and toast until golden, about 3-4 minutes. Turn off heat and immediately stir in garlic, dried basil and 1 tablespoon of brown butter. Set aside. *Heat a large skillet over medium-high heat. 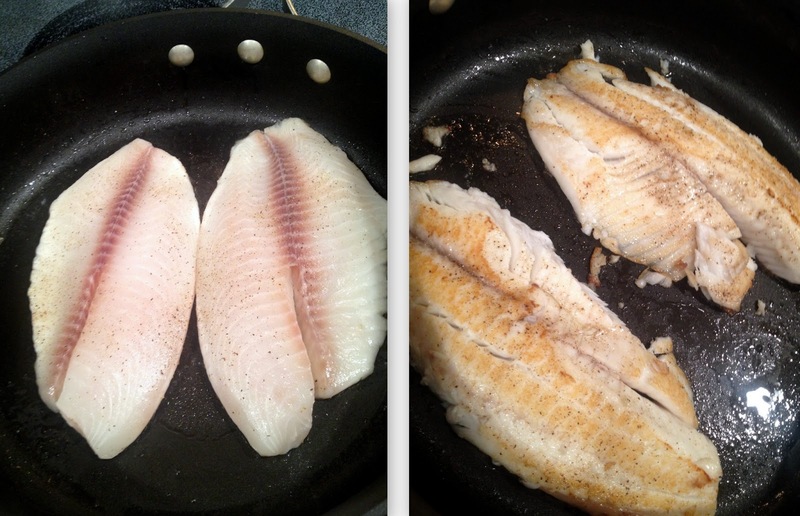 Season tilapia with salt and pepper. **Heat brown butter and garlic in small saucepan over low heat for 30 seconds. Turn the heat to medium-high and add the wine, lemon juice and lemon zest. Let the wine bubble and cook off for 2-3 minutes. Season with salt and pepper. Toss with cooked angel hair pasta and set aside. *Add olive oil to the skillet and add in tilapia. Cook 2-3 minutes per side, or until slightly golden or opaque. Remove from heat. Right before serving, drizzle with remaining brown butter and breadcrumbs. **Place pasta on a plate and lay tilapia on top. 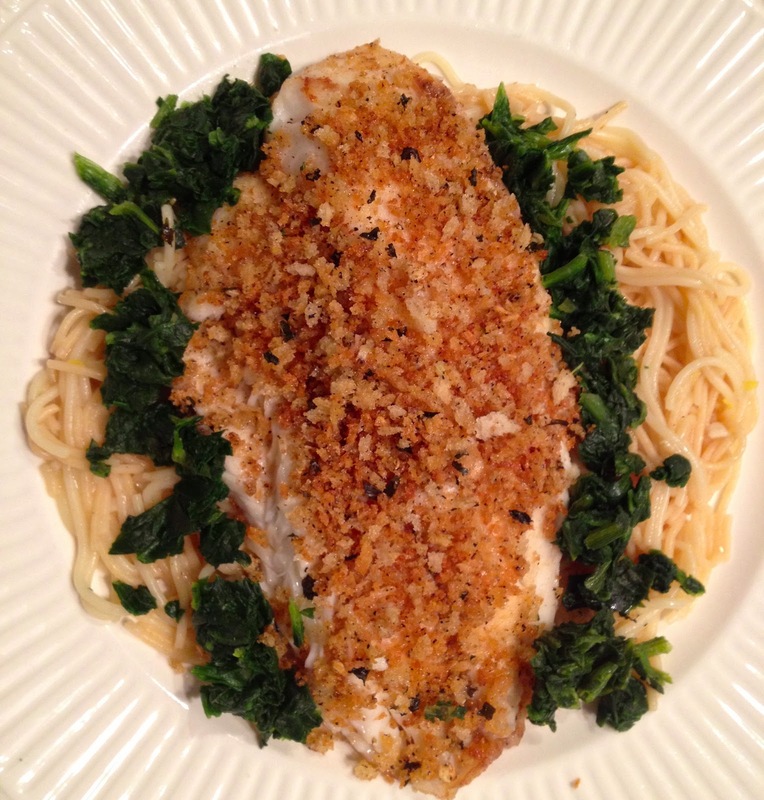 If desired, surround fish with a bit of spinach for added color and some extra veggies. Enjoy!